-Melo was drafted 3rd in the 2003 NBA Draft, and had a damn good rookie season. In just his 6th NBA career game, Melo would score 30 points becoming the second youngest player at the time to do that. Melo also became the third youngest player to reach the 1,000 points during this season and set a new Denver Nuggets franchise record for most points scored in a game by a rookie with his 41 point performance against the Seattle Supersonics in March 2004. Melo would win Rookie of The Month for the Western Conference each month of the season, as well as NBA player of the week twice leading to him being the runner up for Rookie of The Year behind Lebron, of course. Before Melo arrived in Denver, they went 17-65 the previous year. His rookie season, they went 43-39 and actually made the NBA playoffs with the 8th seed. A hell of a season for Melo and the Nuggets. -Though Melo couldn't get the Nuggets out the first round just yet, he had made them a formidable playoff team at least for his first 2 seasons. Melo began coming into his own here, and ended up averaging 26.5 points per game, leading the team in scoring. Melo would achieve feats such as his 1,000th rebound and 5,000th point this year, and hit numerous game winning shots throughout the year. He was also named NBA Player of The Month for March 2006. -The 2006-2007 season was quite a strange one for Melo. On the bad side, his team was eliminated again out the first round of the playoffs, and Melo was suspended for 15 days after a fight during the Nuggets vs Knicks game. However, Melo would go off for 6 games straight, not one but two times that season, for 30 points or more per game. This was also the season where the Nuggets acquired Allen Iverson, giving the Nuggets an extra bit of star power. Melo wasn't necessarily voted in to be an All Star, but with injuries and such, he experienced his first All-Star game that season as well. Melo kept inching closer to greatness. Could he make it out the first round? -The Nuggets were never a team who consistently made the playoffs or even cracked 50 wins often in the team's history. However, Melo had them in the playoffs every season he was with them and had them get 50 wins three straight seasons(2007-2008, 2008-2009, 2009-2010). Melo proved himself to be a team leader while in Denver, allowing some aggression to be shown and his win to will seemed to grow with every year. The Nuggets even tied their franchise record for most season wins with 54 during the 2008-2009 season. 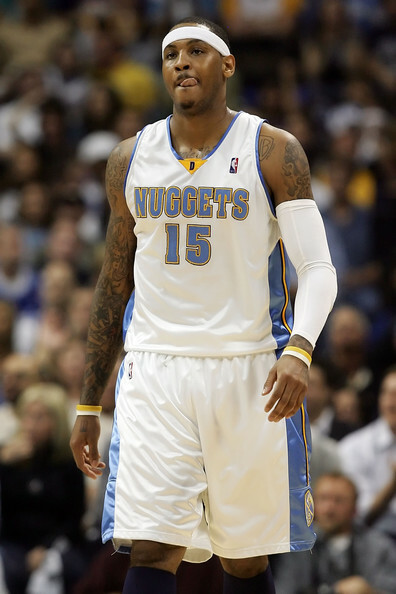 Now, Melo had led the Nuggets to the playoffs every year, led them to consecutive 50 win seasons, could he finally lead them out the first round? -It seemed to begin to haunt Melo just a bit. He could never seem to get the Nuggets out of the first round in the playoffs. Year after year, the Nuggets would make the playoffs, only to lose soundly in the first round. There was a lot of talk that Melo didn't have it in him to make it beyond the first round. Well, after the landmark 2008-2009 season, where the Nuggets tied their franchise record for most wins, the Nuggets managed to finally crank out a series victory in the first round with a dominant 4-1 series win over the New Orleans Hornets. The Nuggets used that momentum to gain yet another series win, as they proceeded to do the same against the Dallas Mavericks and dominate 4-1. Melo was finally headed on the road to the Finals as he made it to his first ever conference finals, but got stopped short by the Los Angeles Lakers. Heartbreaking, but Melo had no other choice but to regroup and try to get it figured out accordingly. -The Cavs were on a huge winning streak, having won their last 13 games. All Star Weekend 2010 had already gone down and things were back on track in the NBA world, as the Nuggets ended the 13 game winning streak and Melo hit a game winning shot with 1.9 seconds left on the clock. One of Melo's biggest moments. Melo had a lot of great moments with Denver and good seasons before leaving them for the Knicks. He was at the top of his game and still perfecting his craft. Hope Melo can get back to that.